Cut 8 cleared at last! Anyway, back to business at Rossnaree. There was prolonged rain overnight which thankfully had cleared by morning. This moisture did wonders in each of the cuttings because suddenly there was, once again, some colour in the soils. Instead of a continuous hard-packed dusty pale yellow surface like concrete, we could see all shades of brown, orange, yellow and even red. At last we had some clarity and we able to distinguish between the last skims of ploughsoil and the undisturbed natural. If only this had happened a week ago it would have been much more helpful, especially in Cuttings 7 and 8 where had such difficulty. 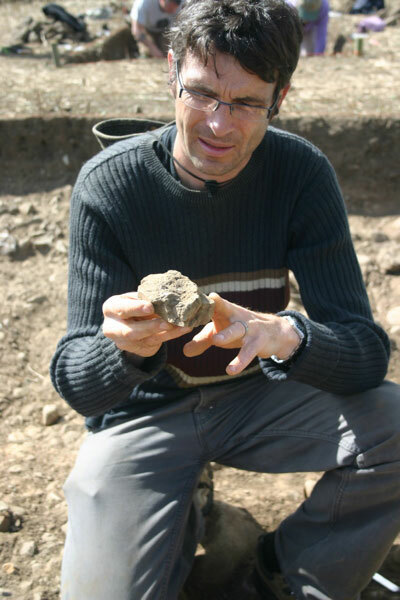 That’s the way the breaks come – all real discoveries inevitably seem to come in the final week of the dig (remember what happened last year!) or, worse in the last day or two. 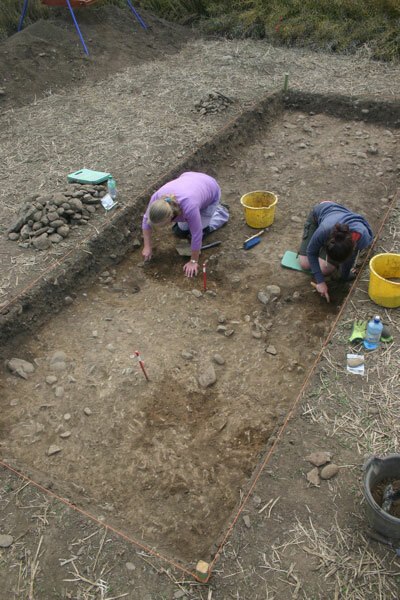 Sieezing the opportunity presented by the conditions, Darren, Sophie and Ciara trowelled over the surface of Cutting 8 one last time to reveal a number of disturbed areas which are probably the remains of additional graves in the cemetery. 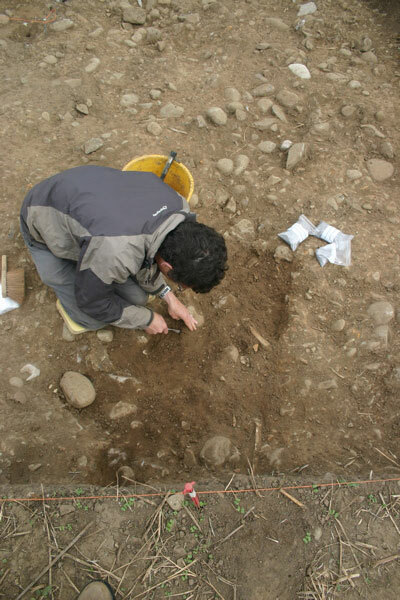 At this late stage of the dig it is not feasible to excavate further but we at least have been able to identify and record the location accurately. All of the new detail was added to a plan of the cutting later on that afternoon. In Cutting 7 we were joined by Rossnaree veteran Kieran Campbell who was a member of the team from last season. 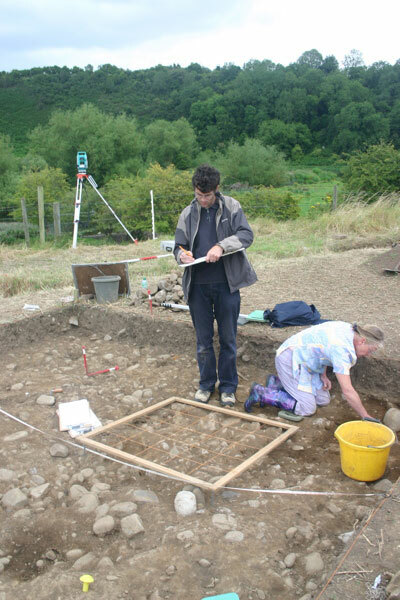 Kieran very kindly offered to help out in the last few days of the dig – exactly the time when he is needed most. 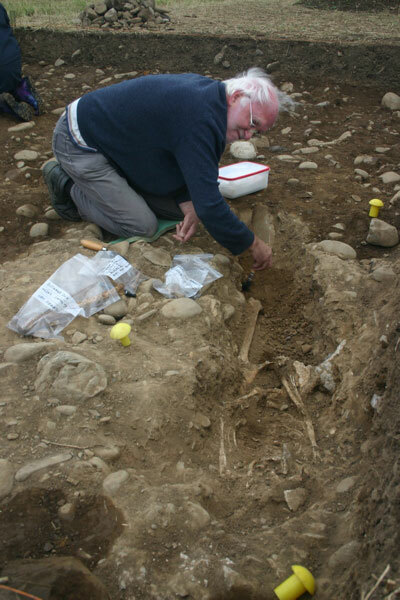 Kieran undertook to lift the skeleton in Burial 2 along with Matt. 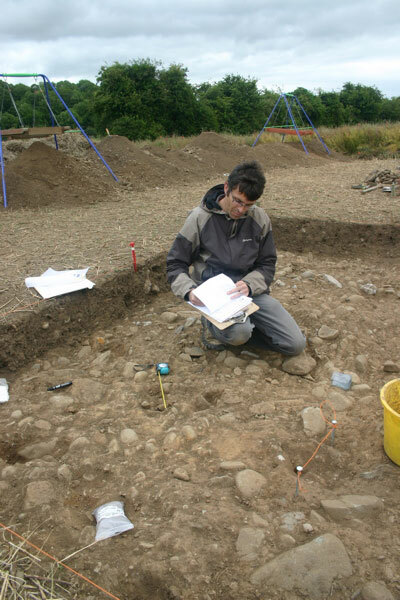 Mags recorded a number of the features that Matt had previously examined in the cutting by drawing sections and profiles of them. 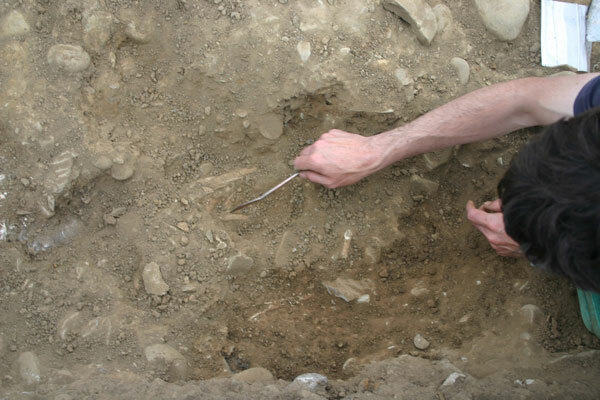 Matt later finished drawing the post-excavation plan of the cutting and he added the detail of the grave cuts. When this was done he drew up the southern section face of the cutting showing the depth of ploughsoil and the various levels within it. 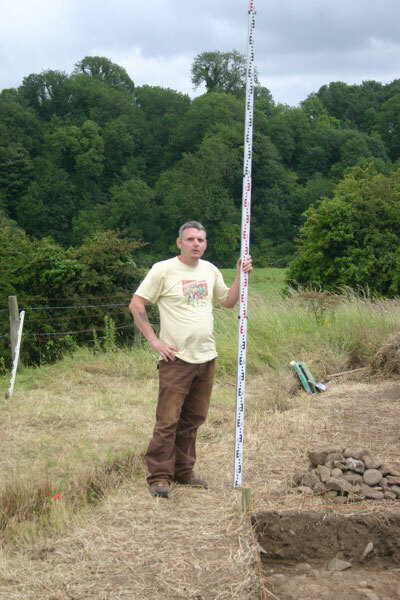 Kevin was also on hand again today and using a total station he accurately recorded the positions of the control points we had installed around Burial 2. 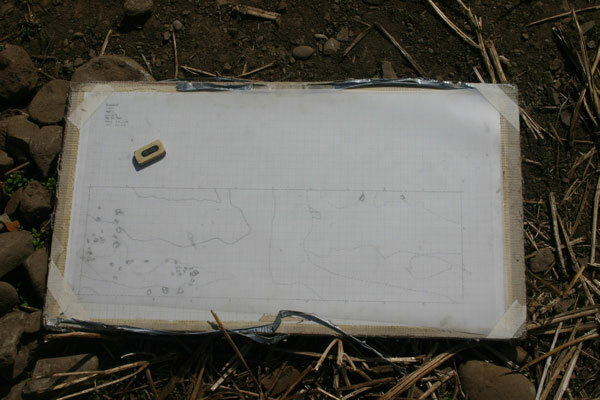 He also surveyed in the location and shape of each of the grave cuts of Burials 1 and 2. 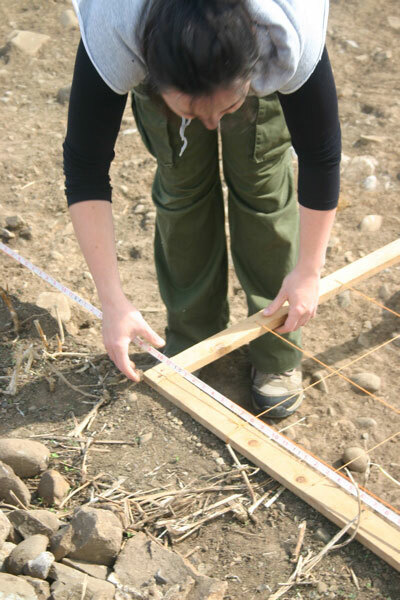 In Cutting 6 Eimear carried out post-excavation plans of the two completed sections and also drew up the profiles of the sides of the cuttings. 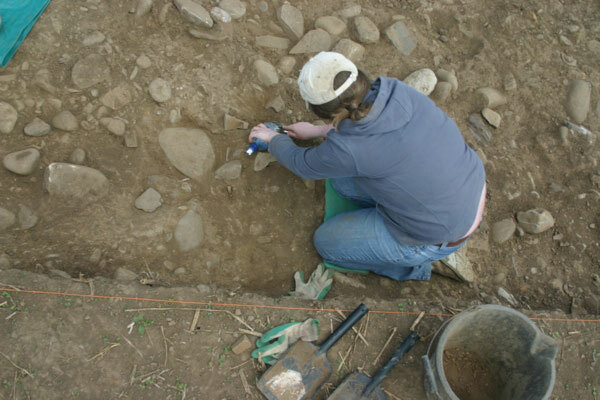 Niamh continued to excavate a section through the oval enclosure ditch and this is turning out to be quite a substantial feature. 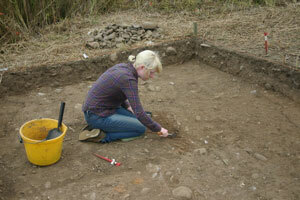 It is a lot deeper and wider than we had anticipated but she has found the edges on either side as well as the base. Very good work for one day. Tomorrow, we will finish the last of the recording and then start the backfilling. I’ll let you know how we get on. Work continued from yesterday with Eimear planning in Area 1 (Cutting 6), Matt excavating features in Area 2 (Cutting 7), Niamh extending the cutting to expose the full extent of the grave cut, and the rest of the team taking down the rest of the base of ploughsoil material in Cutting 8. Kevin, our geophysical surveyor, was also on site again to monitor progress, compare the excavated features to the anomalies identified in the initial surveys and take some additional readings. Eimear adjusts her planning frame. In Area 1, Cutting 6, Eimear’s plan is nearing completion. The process is taking some time because of the size of the cutting and the complexity of the features and soils there. However, she is nearly finished and we will be taking levels on the surface tomorrow morning and assigning numbers to each of the separate fills and features. We even made a start this afternoon on one spread of material that seems to be occupation/refuse spread associated with the occupation of the oval enclosure. This appears to overlie the lower north-south ditch fill so we set Igor up to put a section across it to assess its depth. By tomorrow we will hopefully know what its exact relationship is to the other features and fills around it. Matt examines the burnt stone. Matt continued to deal with other features in Cutting 7 while Niamh and Sarah excavated the 1m x 0.5m extension to the cutting to fully open up the grave cut. 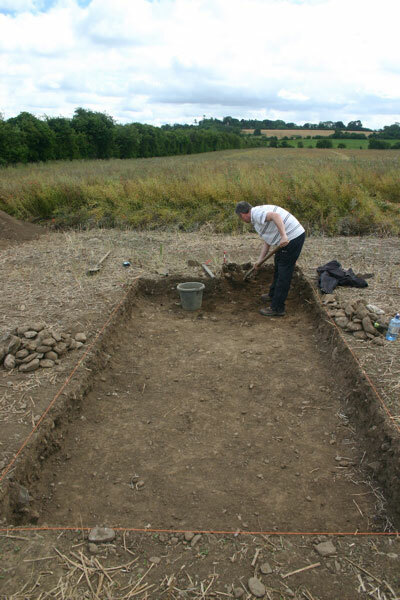 His feature today, numbered F.705, appeared on the surface as a spread of charcoal flecked soil extending over an area c.1m in extent and disappearing beneath the northern baulk. 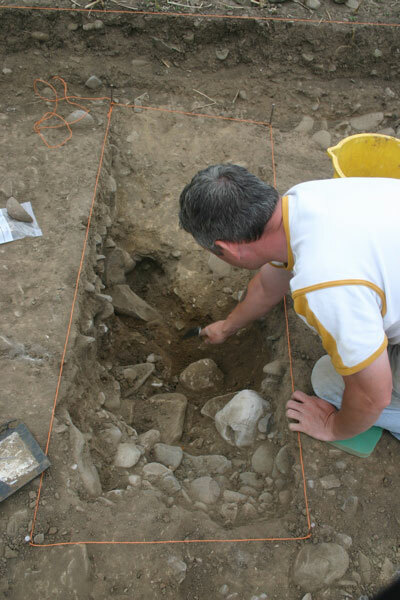 As Matt excavated the feature revealed itself to be small furnace with a number of heat-shattered stones around and in it. 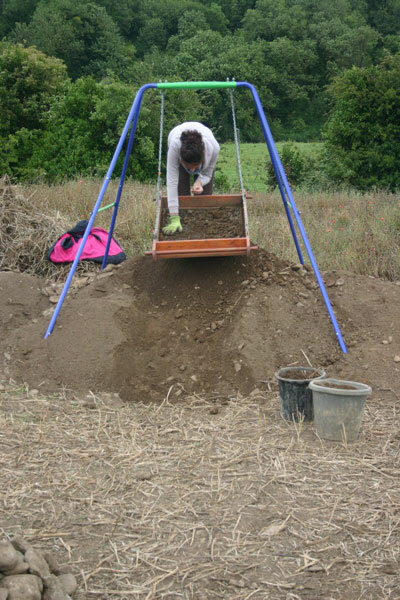 The fill is mainly charcoal-rich soil, which we sampled. There was also a stone with a distinct concretion suggestive of some sort of slag, waste material from an industrial process, possibly metalworking. The base of the feature was reddened, baked soil, indicating intense heat. The proximity of this feature to the grave is interesting as it is not unusual to have such industrial features close to burials on non-ecclesiastical sites. 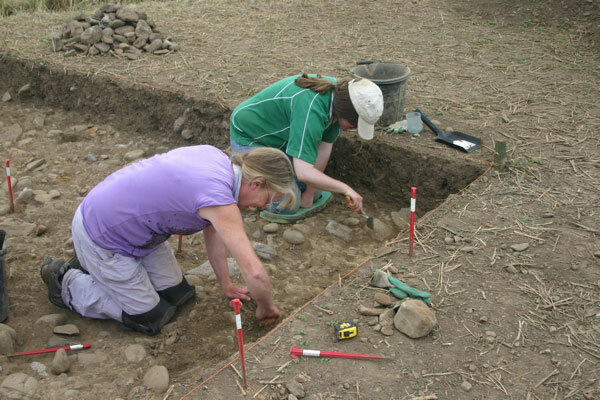 Niamh, Sarah and Ciara gradually removed all of the ploughsoil from the extension and revealed the line of the grave cut retrieving a fragment of cranium from the ploughsoil Matt then added this detail to the previously drawn plan and proceeded to tidy up the area and continue to excavate it. Lisa and the post hole. 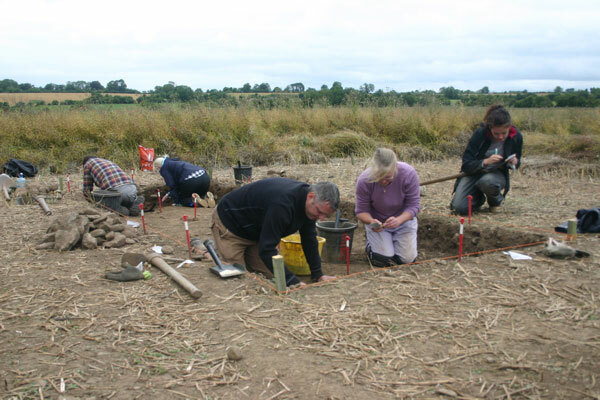 In Cutting 8 the team there continued to remove, using trowels, the base of ploughsoil/interface layer. 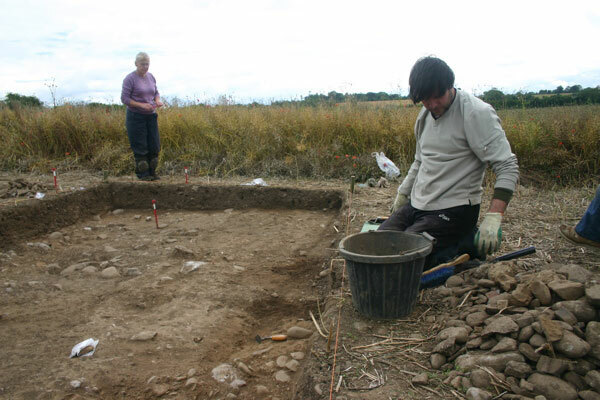 At the southern end of the cutting Igor had recovered a number of pieces of human bone and a tooth which indicates that there were probably other graves in that area which are now destroyed by ploughing. There is also a small gully-like feature here which appears to be relatively late in date and may be associated with later agricultural activity. 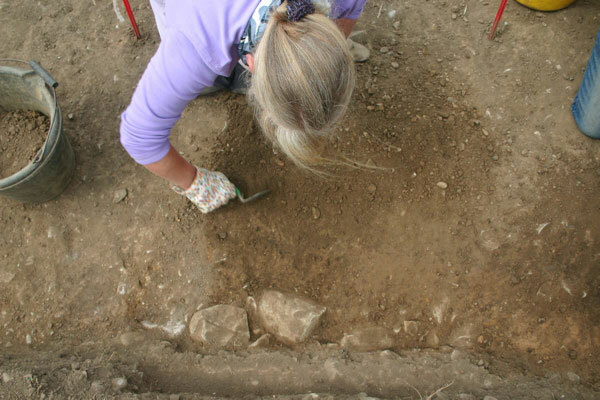 Also at the southern end of the cutting, Lisa found her first feature. It looks at this stage like a very nice post-hole – an area of loose darker soil surrounded by a ring of packing stones. We will take a closer look at it in due course. 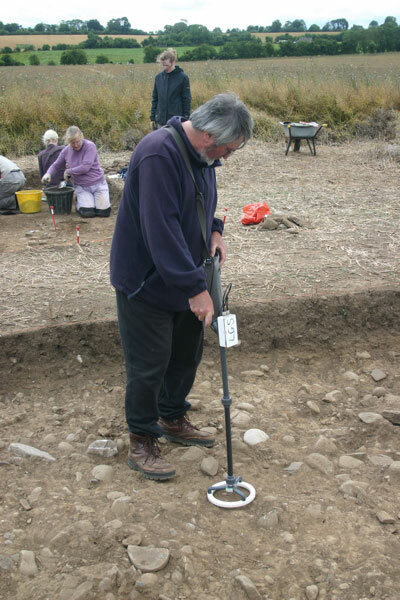 The metal detector in action. Setting up the total station. Kevin was on hand again to look at how work was progressing. He took additional magnetic susceptibility readings from the excavated surfaces of each of the cuttings and recorded interesting results. 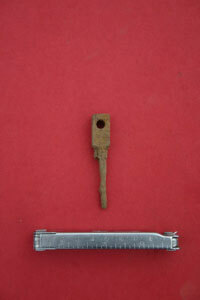 The values were all significantly higher than those recorded at the surface prior to excavation. 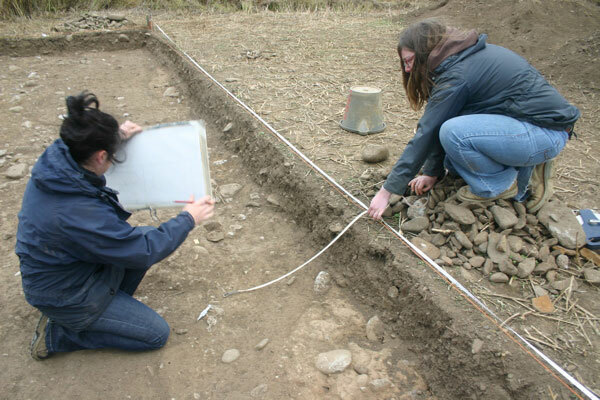 There will be a very useful dataset gathered by the end of the excavation to carry out detailed comparisons between pre-excavation surface readings and post excavation readings as well as surface soil samples and ‘top of archaeology’ soil samples. 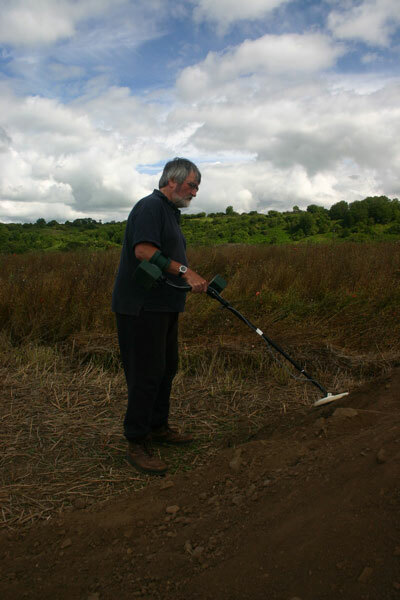 Kevin also took the opportunity to scan the spoil heaps with a metal detector to ensure that we hadn’t missed anything (I don’t think we have but you never know..!) 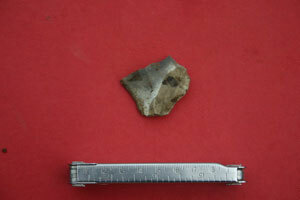 and he also scanned the unexcavated surfaces around the cuttings. 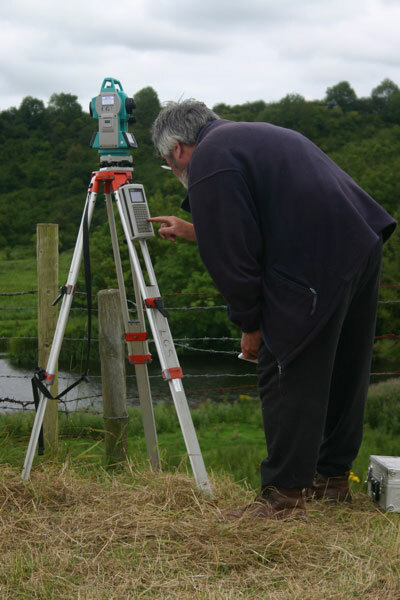 In the afternoon, Kevin used a total station to survey in some of the major features identified on the site so far like the grave cut and the edges of the ditches in Area 1 Cutting 6. In the afternoon we had a bit of diversion when the group of students currently working a the Blackfriary site in Trim paid us a visit. 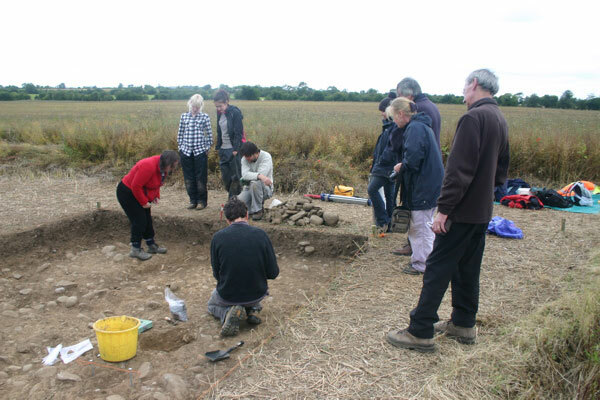 They are part of the Irish Archaeological Field School and on their way they visited the Bective site. I think the students enjoyed their visit and they told us that it was quite different to the other two sites. Today was cold but dry. There was a wind from the north west for much of the day which meant that most people on site kept their coats on all day. A wooly hat even appeared – I’m not naming any names. Thankfully, the day remained dry and we were able to get a lot of work done again. 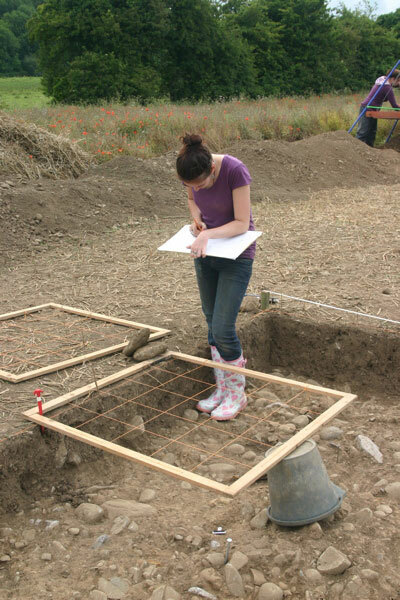 Eimear continued planning Cutting 6 and was assisted at different times by Lisa and Ciara who were introduced to the system of drawing archaeological plans, measured to scale. It is a big cutting and this work took the whole day. 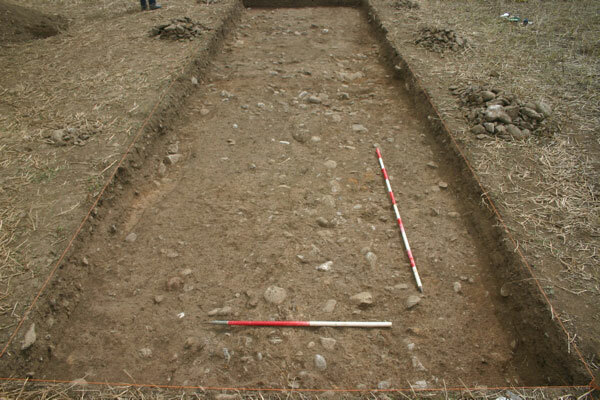 It will be finished tomorrow and we will then number all of the separate features and fills that are visible and take levels on the excavated surface. The team trowel in Cutting 8. 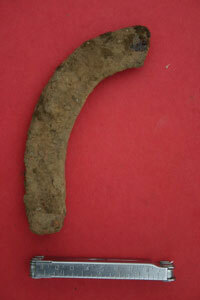 In Cutting 8, the team finished taking down the last of the ploughsoil and then began to trowel back the surface. As predicted, this was a lot easier and quicker to carry out than in either Cutting 6 or Cutting 7 because we are now so familiar with the depth to natural and the appearance of the subsoil. Matt keeps up with the paperwork. 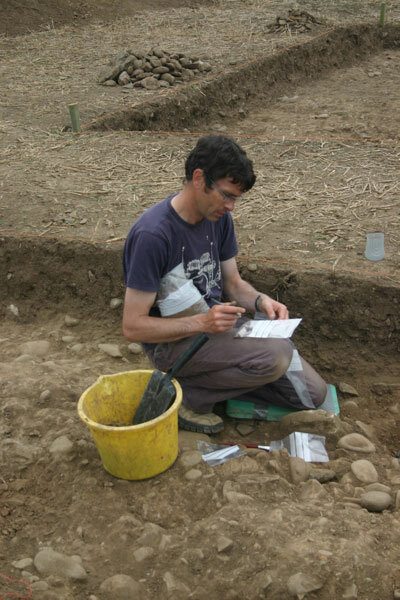 In Cutting 7, Matt continued to examine the various features that were identified. Some of these are a lot less substantial than they seemed on the surface as they might only be the very deepest traces of largely destroyed features remaining below the level of the ploughsoil. Nonetheless, some are still promising. 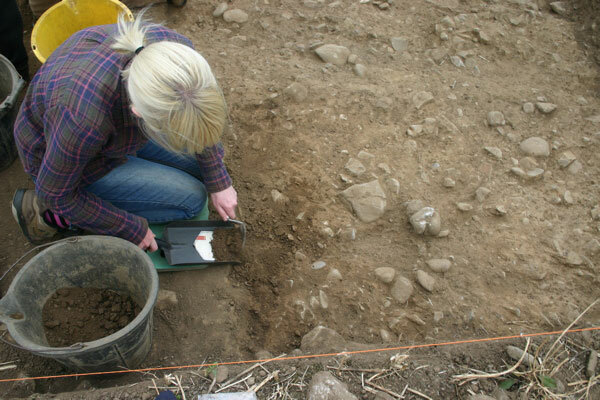 Laureen examines the bone remains. 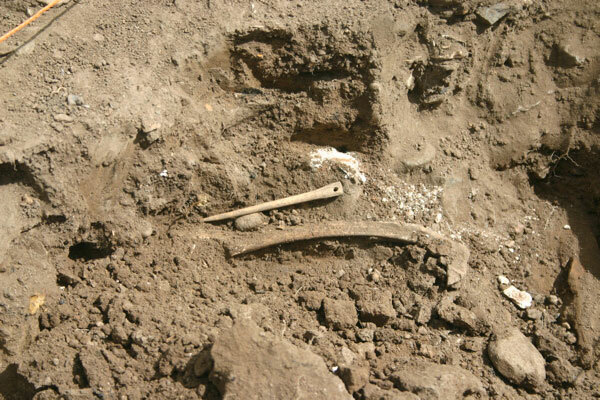 The ‘mystery feature’ I mentioned yesterday has been confirmed as a grave cut with a number of human bones in it. 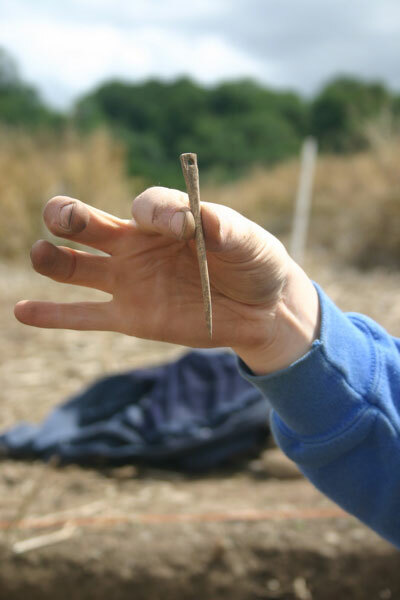 This was identified for us today by Laureen Buckley, Ireland’s foremost osteologist (specialising in the study of human bones from archaeological sites). We were given instructions as to how to go about excavating and lifting the bones which are in poor condition and quite fragile. 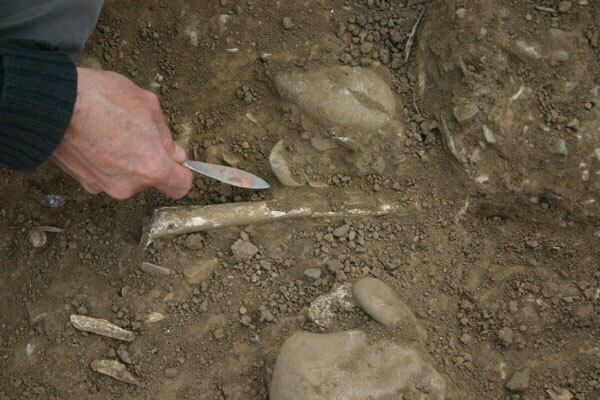 We will also need to extend the cutting to expose the full length of the grave and recover all of the bones. 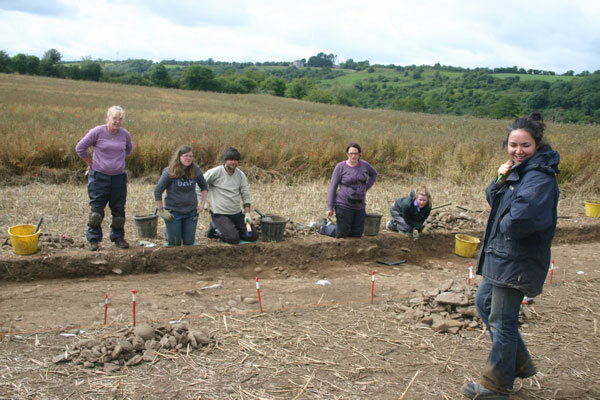 Laureen talks the team through the detail of the burial. 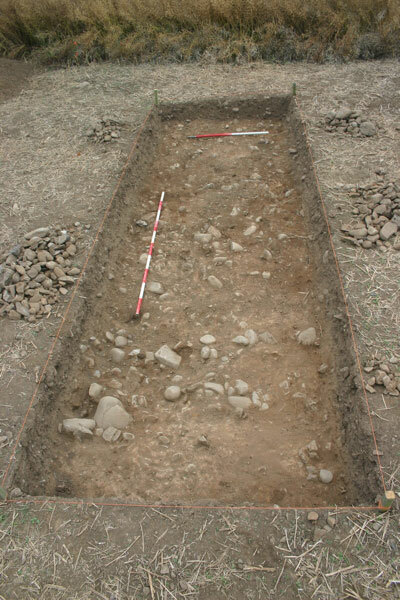 The burial was quite disturbed by previous activity on the site including ploughing and the bones had been moved from their original positions within the grave cut. This work will take some time because the bones are so fragile and every care must be taken to ensure that the job is done correctly. 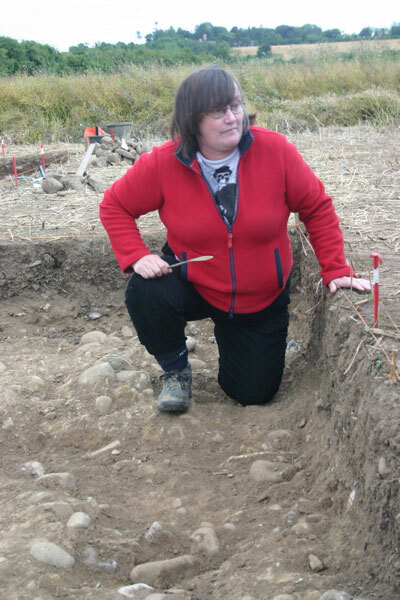 We were all very lucky that Laureen kindly gave a short talk to the team about recognising and dealing with human remains on an archaeological site. I think I learned as much as the volunteers. We’re over the half-way mark now and beginning to think about making sure we are able to finish everything we start in the time available. We were joined by a new person this morning for a few days – Igor – who was involved in the geophysical surveys of each of the areas immediately prior to the start of the excavation. 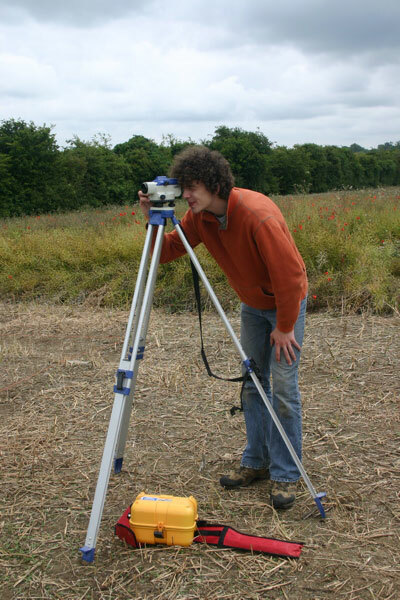 While Igor now works mainly in geophysical surveying, he has spent time on a number of the Celtic Tiger road schemes and his experience is welcome. Matt and the ‘mystery feature’. The weather over the week-end had been quite mixed with a lot of showers. This was good for the site because when we arrived down and took a closer look at the cuttings, the additional moisture in the soil has made it a bit easier to see the differences in the colours and textures of the soils making up the fills of features. 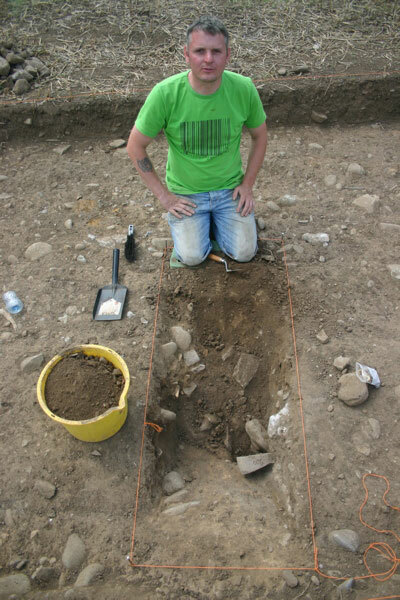 In Area 2 Matt continued to examine features that were identified and planned last week. He did this by half-sectioning them. 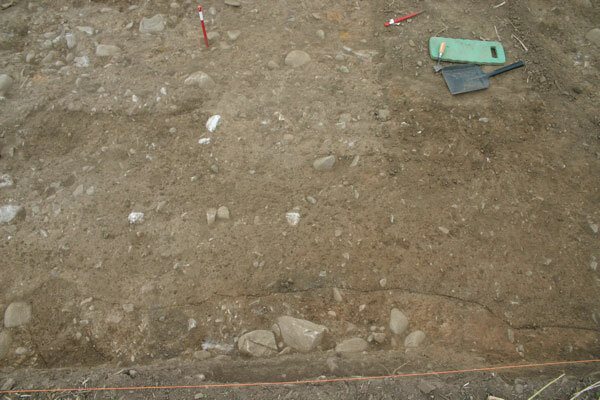 This is where half of the feature is excavated using a trowel or a leaf trowel to find the exact extent and the cut and base of the feature before excavating and removing the second half. 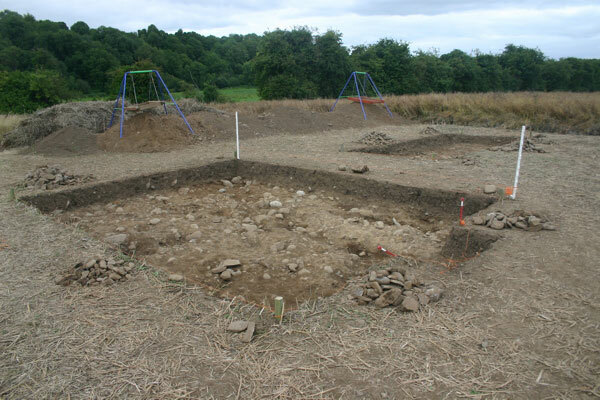 This usually means that the excavation of the second half of the feature is more accurate and ensures that any soil samples, which are only taken at this stage, are less likely to be contaminated with other soils. 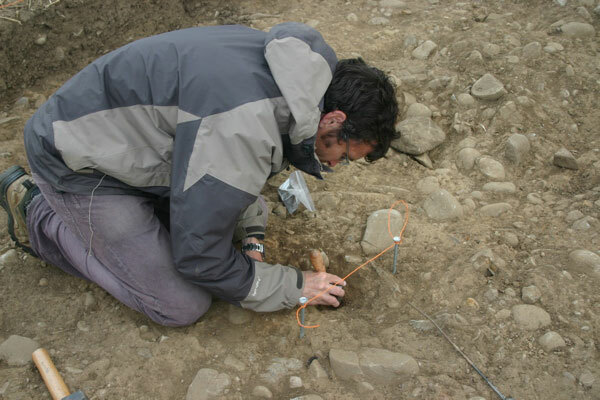 These soil samples can later be processed to identify macrofossil remains, i.e., fragments of vegetation etc. 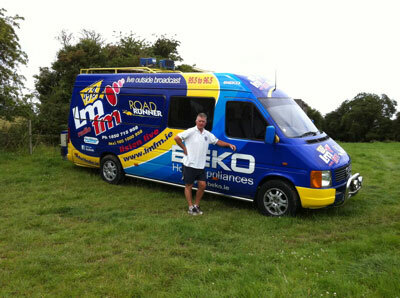 which, in turn, can tell us about the environment around the site at the time the feature was in use. Most of the features that we had identified turned out to be less than exciting. 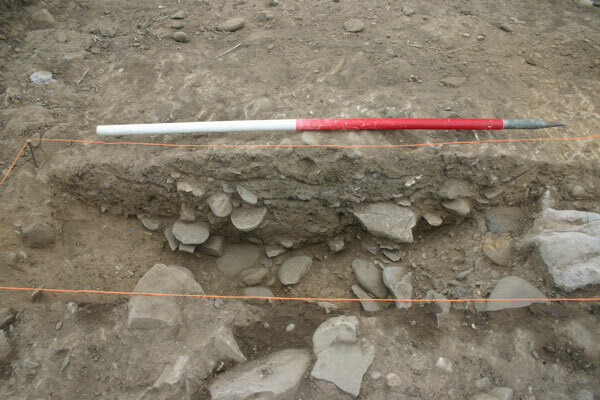 Many seem to be pockets of soil that had accumulated in deeper-than-usual hollows left in the subsoil where large cobbles were disturbed by ploughing. 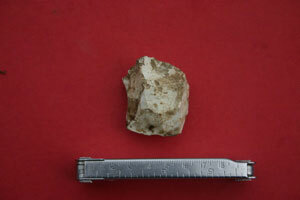 However, there is one area where there may be a substantial feature containing a number of fragments of bone. We have labelled this Feature 714 and we will take a closer look tomorrow before coming to any conclusions. I’ll keep you posted. Sophie on the sieve (again!). Darren and Sophie continued to take down the ploughsoil in Cutting 8 and this was almost completed by finishing up time after a burst of very robust mattocking by Igor. Once the cutting clear, we will work it back again to find the base of ploughsoil in the same way as we did in the other cuttings. However, this process should be a lot quicker this time because we have a very good feel for what the local subsoil looks like and at what depth we should expect to find it. In Area 1 the cleanback continued in preparation for photographs and planning. The whole surface of the cutting had to be troweled over lightly again because a certain amount of dust and other debris had blown in over the week-end and the rain had made the surface less clear and distinct. Eimear was in charge and by the afternoon, the photos were taken and the planning could begin.